Shangri-La is a fictional valley that appeared in James Hilton’s novel of 1933 entitled Lost Horizon. It talks about a place somewhere in the Himalayan regions that appears to be an idyllic paradise. People live in absolute peace and harmony, the land abounds in natural resources, and people occupying that land age very slowly. 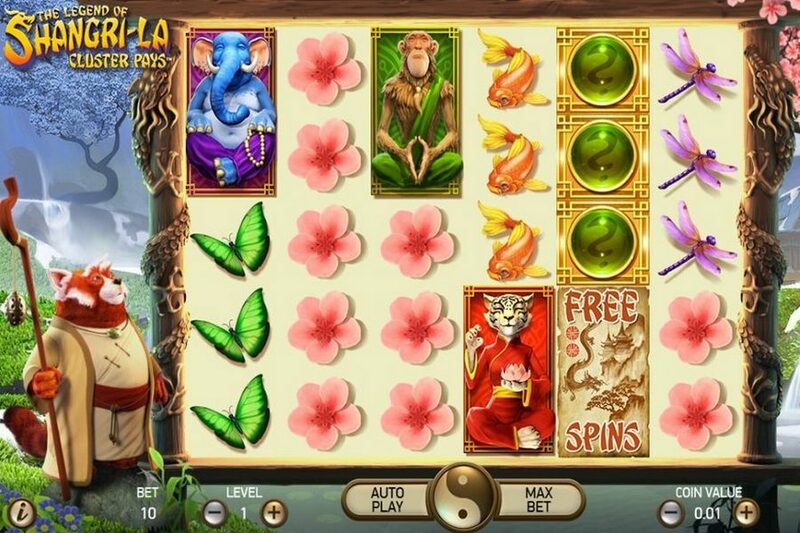 This fantastic paradise on Earth is brought to life in the slot machine gane "The Legend of Shangri-La" by casino games provider, NetEnt. In the online slot game You’ll see lovely trees, green pastures, ancient temples, and cascading waterfalls, all designed with an Asian motif that is appropriate given the theme. Elegant sound design and an animated character (a serene, anthropomorphic red panda) standing beside the reels serve to complete the scene. As with all new NetEnt video slot games, this machine is fully mobile-optimized, with touch screen versions existing that make it even easier to play on a tablet, iPhone, or Android smartphone. Gamblers can choose from a variety of different denominations for their coins, and 10 different bet levels, allowing plenty of room for both low limit casual players and high rollers to enjoy this machine equally. The online slot game is a 6-reel, 5-row video slot with the Cluster Pays mechanic, featuring Sticky Re-Spins, Random Substitutions, Nudge Reel and Free Spins. Pay symbols are all stacked and consist of gold fish, fireflies, butterflies and sea flowers at the low end as well as the Monkey Guru, Elephant Guru and Cat Guru at the high end . 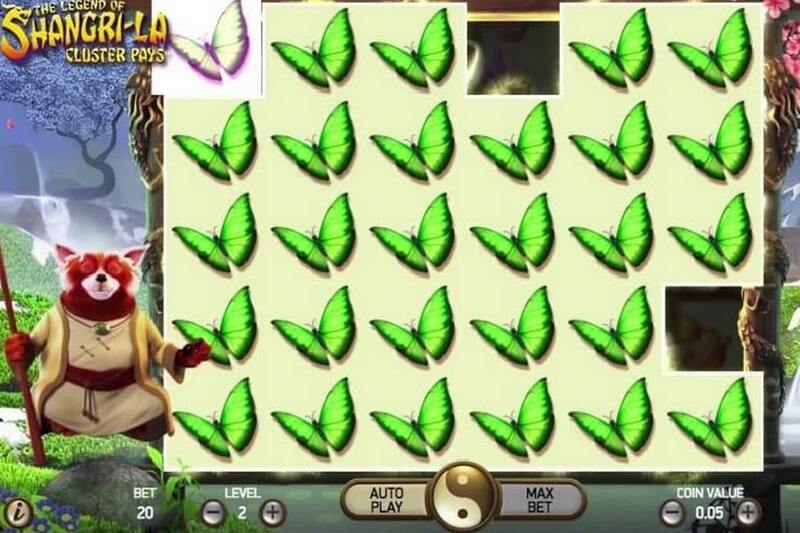 Wilds or, as they have been called for this slot, Substitution Symbols are question marks which will magically transform to the highest adjacent symbol to give the best possible win combination. Pays for a full screen of symbols range from 200x – 1,000x bet. Scatters are a beautifully crafted tile showing a mountain scene with the dragon flying by and the words Free Spins across it. Minimum three are needed to trigger the bonus round. 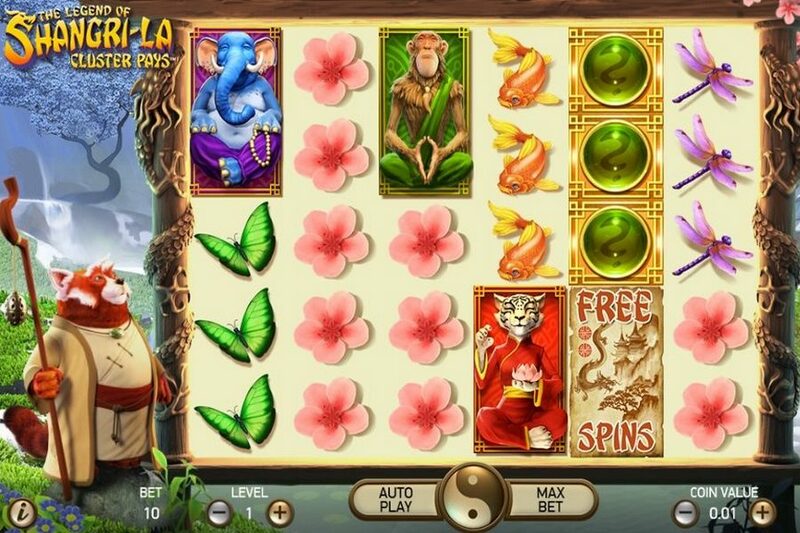 The wins at online slot game are awarded for clusters of symbols, just like on the first game of this Netent series, Aloha! Cluster Pays. This unique pay mechanism provides ample chances to really take hold and bring in those big wins. A minimum of 9 is needed for the lowest win, comparable to a 3OAK on a normal slot, up to a maximum of 30 for the top pay for each symbol. Might take some time to see that full screen though, especially for the top paying symbols as it seems very hard to get past 15 low paying ones and 10 – 12 of the high paying symbols. After each spin and once the reels have stopped, between 2 and 6 Substitution symbols are added to the reels. If the Substitution symbols of slot can create a winning cluster, they will transform into the selected slots symbol and potential wins added. Before the next spin, between 1 and 4 Substitution symbols are randomly removed from the reels with minimum 2 always being kept. Extra Spin: If the total win from the Free Spins round is less than 10x bet, 1 additional spin may be awarded with no Substitution symbols being removed from the reels. The slot machine game The Legend of Shangri-La will release on 21st September 2017.